Sawasdee Siam i Pattaya, Thailand: Reservér nu! Sawasdee Siam combines the traditions and elegance of a more leisurely era with the new technology of 21st century. Overwhelmed with spectacular sense once you enter our open-air lobby, appointed in Thai statuary, paintings, crystal chandeliers, antique teakwood and rich marble. 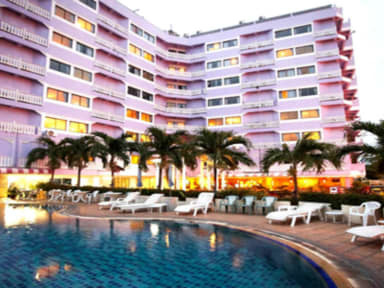 The hotel also provide 24 hours CCTV security camera and a security guard on duty. Other features like Internet Cafe, Thai & International Cuisine Restaurant and room service. Full prepayment Non Refundable, No Amendment. In case of No Show hotel is the right to charge full period of booking. After you done for this condition please let me know then I will let my team to open allotment in your system.